The series Diagnosis: Unknown featured Patrick O'Neal as pathologist Daniel Webster Coffee (created by Edgar winner Lawrence G. Blochman) who investigated cases of murder. I want you to know what shrapnel and "88s" and mortar shells and mustard gas mean. 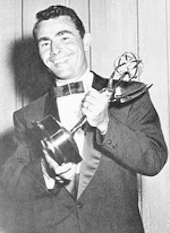 Rod Serling served as a paratrooper in World War II and was profoundly affected by his experiences. In Vincent Casaregola's thoughtful discussion "War in The Twilight Zone: Rod Serling's Haunted Visions of World War II" in Horrors of War, he notes that one-sixth of Twilight Zone episodes are about war (these include "The Purple Testament" with William Reynolds and "The Quality of Mercy" with Dean Stockwell; other examples from Serling's oeuvre are "The Time Element" aired on Westinghouse Desilu Playhouse, "The Strike" for Studio One, and The Rack). In the episode below from Writing for Television: Conversations with Rod Serling, Serling states, "I was traumatized into writing by war events." In this episode of Four Star Playhouse, subway passengers wonder which one of them is a murderer sought by the police. 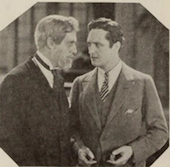 Costars include David Niven and Rhys Williams, in a story by Lawrence B. Marcus and a screenplay by Seeleg Lester and Merwin Gerard. The Unwritten Record blog of the National Archives highlights historic mugshots of counterfeiters—both men and women—from the Secret Service files in its collections. "Fraction of a Second" (w/Bette Davis, 1958). Adapted by Kathleen Hite from the story "Split Second" (in Kiss Me Again, Stranger, 1953) by Daphne du Maurier, this episode of Suspicion features Bette Davis finding strangers in her house, although they insist they are the owners. Costars include Marian Seldes. 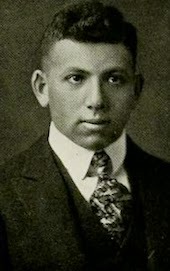 Exhibition on artist Everett Raymond Kinstler. On view until July 4 at the Brinton Museum in Big Horn, Wyoming, is the exhibition "Journeys West and Beyond," which features the work of Everett Raymond Kinstler. Kinstler's oeuvre encompasses portraits of political figures, comic books, dime novels, westerns, and pulp works. This episode of Circle of Fear (aka Ghost Story, 1972, creat. Richard Matheson) features a boy's troublesome doppleganger. Costars are Sebastian Cabot, Helen Hayes, and Charles Aidman; the writers are Edgar winner Stanley Ellin (story, "Robert," 1958) and D. C. Fontana (screenplay). Danger on the Air (1938). An unpopular sponsor is murdered during a radio broadcast, and an engineer (Donald Woods) investigates. This comedic mystery, based on Death Catches Up with Mr. Kluck by Xantippe (aka actress, writer, and radio producer Edith Meiser), features Nan Grey, William Lundigan, and Lee J. Cobb. New pulp reprints from Altus Press. • Doan and Carstairs: Their Complete Cases by Norbert Davis. Boozy PI Doan teams up with his lofty Great Dane, Carstairs. • Champion of Lost Causes by Max Brand (introd. 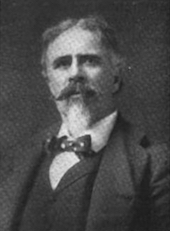 William F. Nolan). 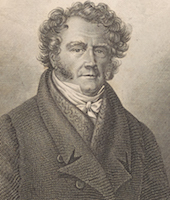 Samuel Loring takes up the cause of a woman accused of murder. 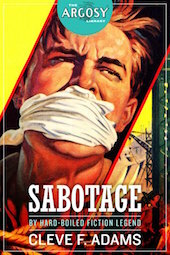 • Sabotage by Cleve F. Adams. Detective Rex McBride races to prevent the destruction of an important dam by an implacable enemy.